Quoting from a Beacon Paint & Hardware flyer (2010), "Beacon Paint & Hardware was founded around 1900. The store started as Beacon Paint & Varnish Co., later changed to Beacon Paint & Wallpaper, and later to its current name. The store originally was located on the West side of Amsterdam Avenue, approximately where the florist is now. Around 1940, Beacon relocated to its present location - 371 Amsterdam Ave. Before becoming Beacon Paint, 371 Amsterdam Ave. was the home of an A&P supermarket. The rear of the store is where the supermarket kept the horse and buggy it used to make deliveries. In 1971, Mel Stark (who previously worked at now-defunct Long Island Paints) bought the store from then-owner Joe Sage. Mel had also worked at his father-in-law's paint store on the East Side many, many years ago. Mel's sons, Bruce and Steven, and daughter, Ellen, now run day-to-day operations; Ellen also serves as bookkeeper. Mel (now 82) is now officially retired." The first listing for Beacon Paint & Varnish Co. Inc. in the Manhattan telephone directory was in 1929 when they were located at 370 Amsterdam Ave. 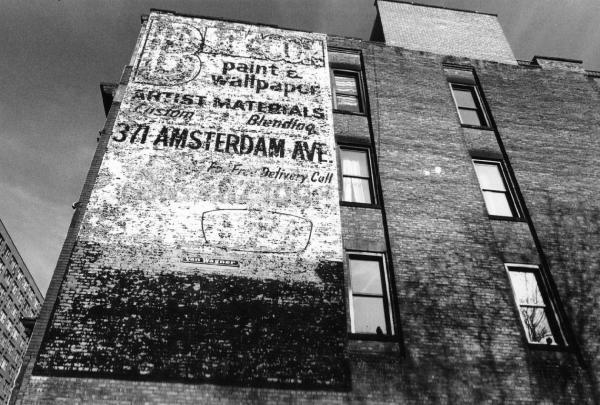 In 1943 they moved across the street to their present (2010) address at 371 Amsterdam Ave. Around 1970 the name changed to Beacon Paint & Wallpaper. The sign presumably is no older than the 1970's. For the condition of this sign 10 years later, see the next image. This ad for Beacon Paint & Wallpaper appeared in the Manhattan Yellow Pages, 1971.